Info "Help me stick the right key into the hole." Key Ring is one of Dribble and Spitz's microgames in WarioWare: Twisted! The game's purpose is to put the right shape into the hole. As the player beats the game, there will be a scene of a wrestler doing something. 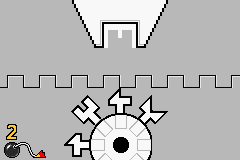 1st level difficulty: There will be three shapes to choose from. 2nd level difficulty: There will be four shapes to choose from. 3rd level difficulty: There will be five shapes to choose from. One of the endings in the Japanese version features the wrestler in a sleeping bag scared seeing a man sleeping with him. This was edited in the North American version, having the man stare at the wrestler through the window instead. This page was last edited on November 17, 2018, at 03:19.